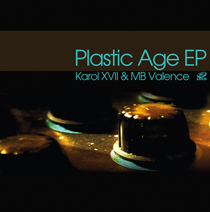 The ‘Plastic Age EP’ is the 70th release on Loco Records and with this EP, Karol XVII & MB Valence have three tracks included in the release: ‘The Bar Around The Corner’, ‘Simple Minds’ and ‘Days Without You’. ‘The Bar Around The Corner’ opens the EP and is quite characteristic due to its unique, punchy, big room bassline combined with stabs of synth over the top line, delicate drums that get accompanied by a subtle piano riff, which in turn adds a lot of flavour to the track. ‘Simple Minds’ starts calmly and then rolls out a steady driving rhythm with seductive grooves and deep, grumbling undertones. The deep chords of the piano together with female vocal interjections make a huge combination for the big room driving sound. The final track, ‘Days Without You’, is full of bouncy basslines rolling underneath unique melodies, vocal stabs, deep textures and noises. A swinging hi-hat pattern, a punchy kickdrum hammering throughout, and fiddle pads with some deep synth shots and gated vocal glitches all contribute to get the track rolling. It’s out 11 February.